This post has some early shots from our Annual Show which was held yesterday at the Donald Simpson Community Centre in Cleveland. It was a great show with high a quality exhibition and a successful bottom line of records set both for attendance and sales. We had paying 460 visitors, including a bus tour from the Sunshine Coast, on the day. 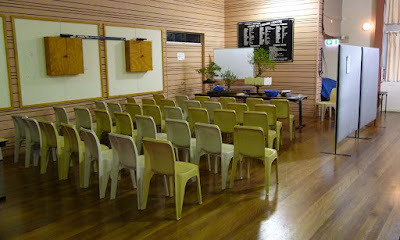 This is the 'before the doors open look' with more photos to in the next post to come of the trees in some detail. With our exhibition on the Sunday, one day only, we setup on the Saturday afternoon. 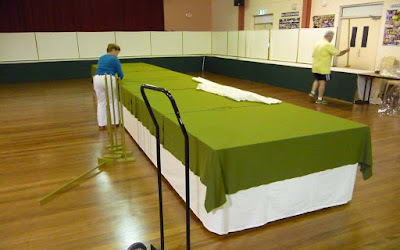 This is a well practised process and usually only takes about 3 hours. Setting up the tables, installing covers and backdrops, positioning the trees and labeling them. And that's just the display area; with the sales area taking almost the same effort. 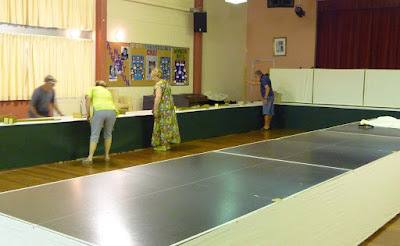 Our dedicated members work like busy ants, almost without direction; a pleasure to be part of. With over 80 trees to be exhibited we made some changes this year to expand the display space and dedicate the main auditorium to the exhibition as well as a demonstration space. 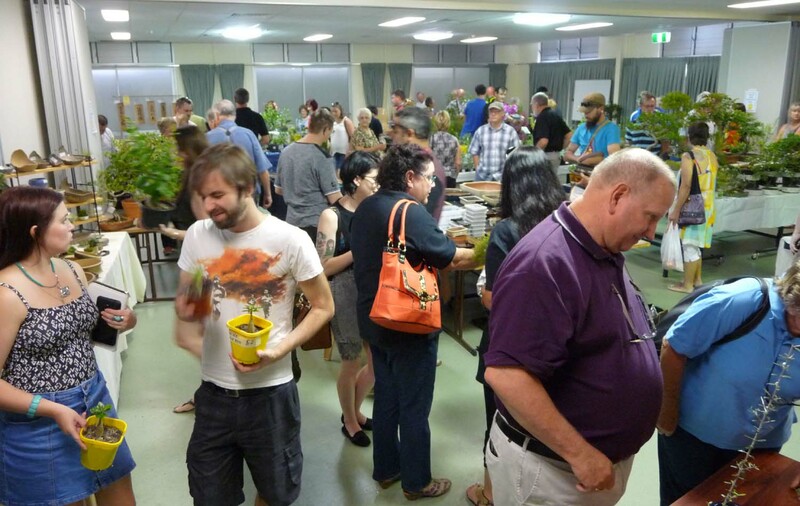 This year we occupied a new space for the sales area which has continued to grow. 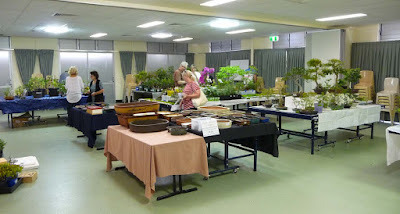 The show has developed a wide reputation and following locally for the quality of the display as well as the quantity and quality of the sales material. Another shot of the sales area. 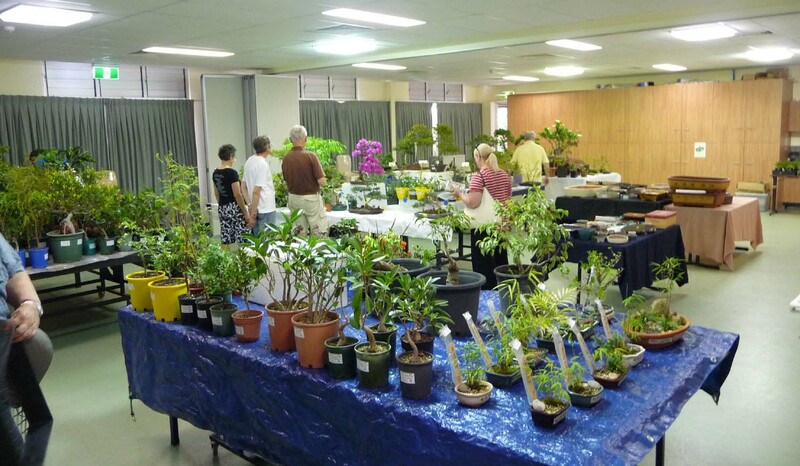 We had everything from tube-stock through to pre-bonsai through long established bonsai as well as a great supply of pots and other materials. 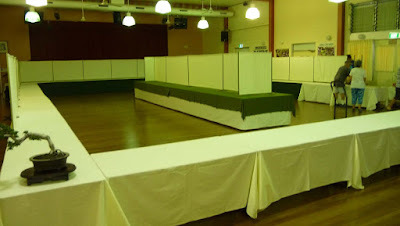 Here we have the display space almost completed. 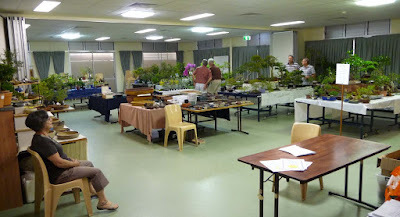 And very soon after the space has been populated and the bonsai chat begins! 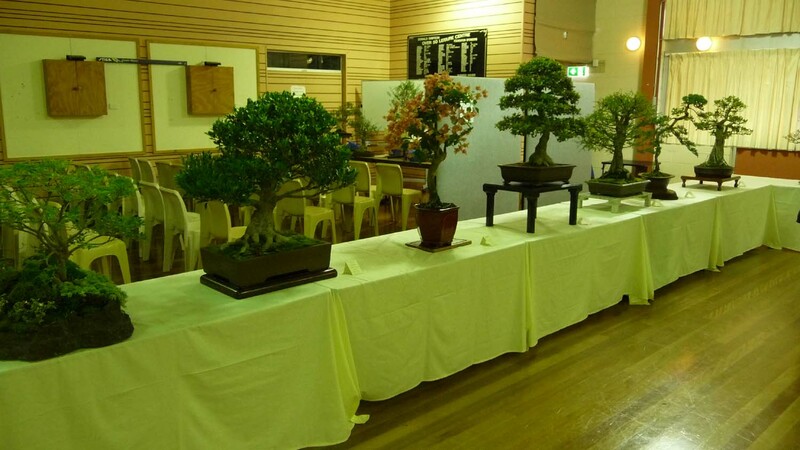 This year we displayed our trees segregated by 4 size categories; under 250mm (Minature), 250 to 450mm (Small), 450 to 650mm (Intermediate) and over 650mm (Large). By all accounts this produced a universally favourable response and made the judging so much easier. Displayed this way our Minatures ( behind the gentlemen in the photo above) this year had a visability they've not previously enjoyed. First and second places were awarded in each size category as well as Best Novice Tree and Best Tree in Show. Almost ready to go in the sales area. All set in the main auditorium. Of the 82 trees on display 40 were native species. 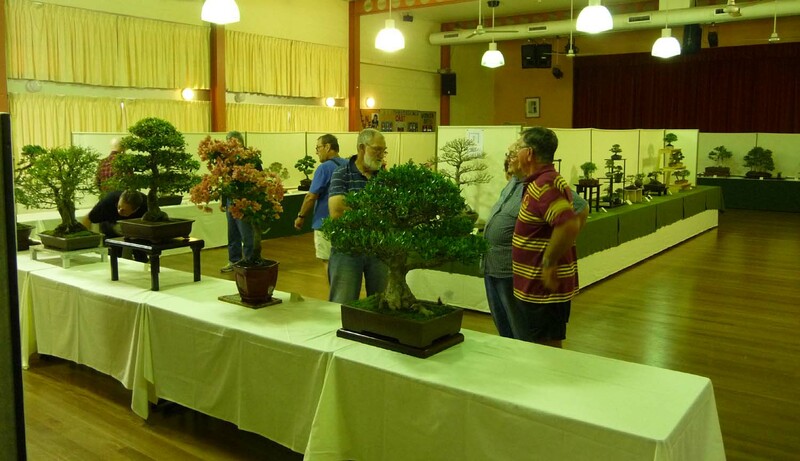 Of the natives, 21 were ficus and next was 7 Melaleuca; attesting to the value of this genus as bonsai. In fact it was a Melaleuca which won Best Tree in Show but more on that in a future post. Of the 42 exotics 13 were junipers. Next was Chinese Elm with 5 examples. 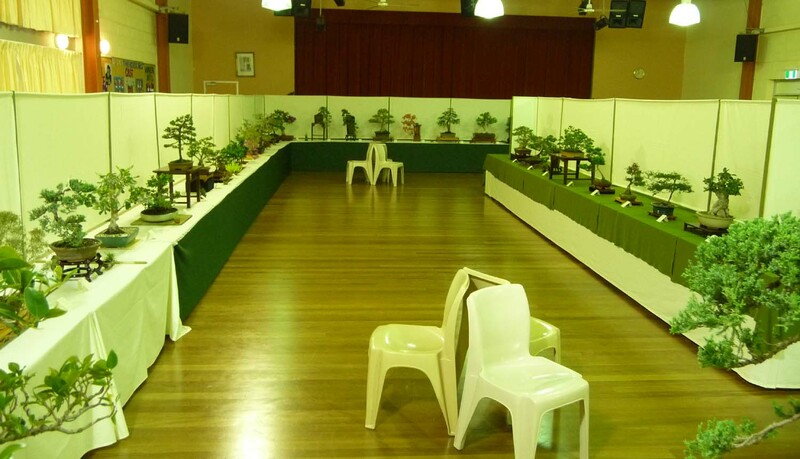 Some of the trees from the Large category with the demonstration area set up behind. Demonstration material ready to go. Averil and Bob Stanley did our judging this year and Averil followed up with a demo on a large Clerodendrum. This is the last shot from this series, taken just as the doors open and the first rush to the sales area. Once the essential frenetic purchases are made people gravitate back to the tranquility of the exhibition. Last but by far from least was the catering area. No shots this post but what a great facility to cater and relax and what a great team that made it all happen without a ripple. 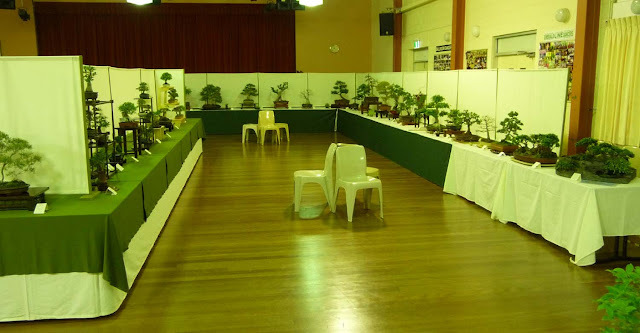 Subscribe now to get automated email advice of the next posting of photos of show trees.